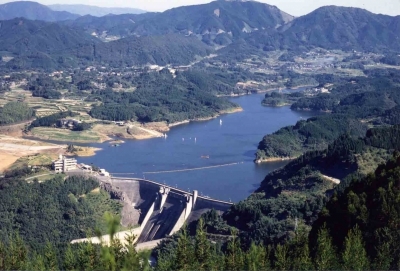 Midorikawa River Dam was constructed in 1971 as a multi-purpose dam for the purposes of irrigation, generation of electricity and mainly for flood control of Midorikawa River. 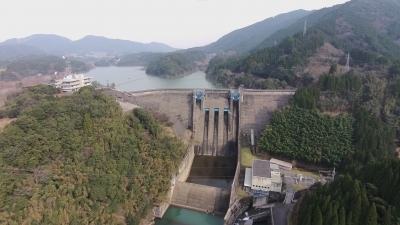 The dam consists of the main gravity dam and the secondary rock-fill dam, forming "Midorikawa Lake." With a campground and a picnic area, this dam is also a great spot to enjoy the nature. There are about 1600 cherry trees planted along the lake, and you can see beautiful cherry blossoms in spring. Midorikawa Dam Museum is located by the lake, and you can learn about the history and the roles of the dam, and the ecology in the area. 30 minutes by car from Kyushu Expressway Matsubase IC or Mifune IC. 80 minutes from JR Kotsu Center, get off at Kkazokumura Nishiiriguchi Bus Stop and walk 25 minutes. At Midorikawa Dam, you can learn about the functions of dam and the facilities. Dam card...Answer the questionnaire and get dam card.